The Glamour! The Drama! The Full Results of the 2013 Hugo Awards! 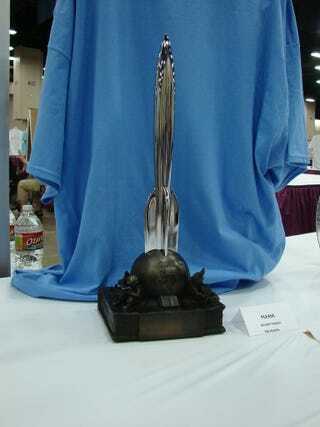 The Hugo Awards just happened at San Antonio's LoneStarCon 3, and it was a night of dramatic reveals. The winners: Game of Thrones! John Scalzi! Tor's Patrick Nielsen Hayden! Ken Liu! Pat Cadigan! Stanley Schmidt, twice! Brandon Sanderson, twice. And Saga! Full details below. Paul Cornell MCed the Hugo Awards this year, and kept the crowd laughing with his jokes about the difference between Smurfs and SMOFs and saying that thanks to George R.R. Martin, "I have no sexuality." But he also struck serious notes, saying he hoped we would one day look back on harassment as "something we used to do," and leading the crowd in giving love to past Campbell Award-winner Jay Lake. Some notable winners: Stanley Schmidt won both the Chairman's Special Committee Award (presented by an astronaut!) and the Best Editor, Short Form Award. Patrick Nielsen Hayden won Best Editor, Long Form and also saw John Scalzi's Redshirts, a novel he edited, win Best Novel. Brandon Sanderson won Best Novella and Best Related Work (among other people) for "Writing Excuses." Three-time Campbell Award nominee Mur Lafferty finally won. And Pat Cadigan, who's been nominated many times but never won, finally won a Hugo, and reminded the crowd about the importance of finishing what you start. And Game of Thrones broke Doctor Who's long winning streak in the "Best Dramatic Presentation, Short Form" category. George R.R. Martin accepted, accompanied by actor Rory McCann (Sandor Clegane), who wore a kilt. And in his acceptance speech, Martin said we're in a golden age for science fiction and fantasy on screen.